Ok, we normally don’t just share a press release word for word – BUT you know I have a love of all things optics. In fact, I started this website with Amy out of hours and hours of research I did on the best optic for my hunting rifle. Leupold is one of my favorite companies and I will be reviewing a scope very soon. Until then check this out…. BEAVERTON, Ore. — Leupold’s® intense focus on product development has culminated in a new generation of tactical rifle scopes that cover the entire spectrum of optics requirements, from close quarters to extended ranges, for war fighters as well as competitive shooters. 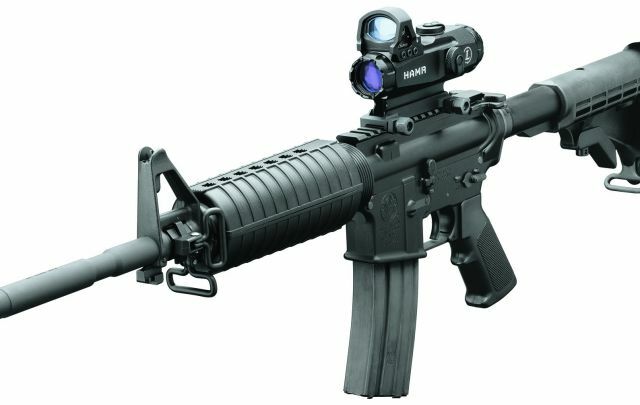 as the primary day optic for its newest sniper rifle, the XM2010. In addition, Leupold recently contracted with the United States Marine Corps (USMC) to supply the CQBSS for use with M2 heavy machine guns and MK19 grenade machine guns. The Marine Corps sight will carry the M521 designation. The ER/T Auto-Locking Adjustment rifle scope is specially designed and built with the military sniper in mind. It has an auto-locking elevation adjustment. This feature ensures that reticle adjustment is maintained during rough going and stressful conditions. Reticle options include the Horus™ H27 and H58, as well as Leupold’s Tactical Milling Reticle® (TMR®). Versatile enough for close quarters battle as well as distances out to several hundred meters, the CQBSS is available with the new Horus H27D reticle or Leupold’s Military-Tactical Milling Reticle (M-TMR™). The M-TMR is designed to allow successful range estimation and target engagement with more flexibility than generally possible with other reticle styles. 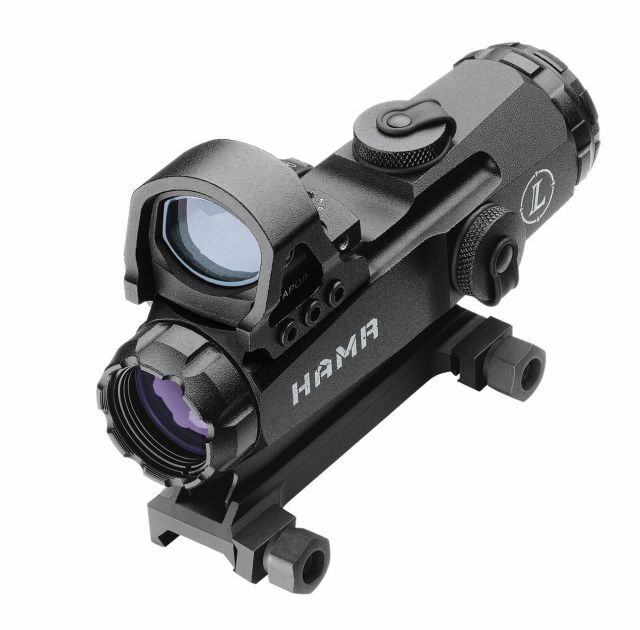 Built for precise mid-range marksmanship and fast target acquisition, the HAMR features an illuminated CM-R2™ reticle. Leupold’s DeltaPoint™ reflex sight, utilizing either a 7.5-MOA Delta reticle or 3.5-MOA Dot reticle, can be attached to the HAMR, providing instant target acquisition capability at close quarters. (DeltaPoint and HAMR are available as a package.) Other recent developments in the Leupold Tactical line include the Mark 4 Close Quarters/Tactical (CQ/T®) rifle scope, which is now offered with the CM-R2 reticle; the Mark 4 20-60x80mm Tactical Spotting Scope available with the Mil Dot or TMR reticle; and the Mark 4 12-40x60mm Tactical Spotting Scope with the Horus H32 (standard or inverted) or H36 reticle (standard or inverted). In addition, the new Integral Mounting System (IMS™), created specifically for most AR and other tactical rifles, features a onolithic, cantilever design for strength and durability under the harshest conditions. The IMS eliminates problems associated with the two most common issues faced when mounting standard rifle scopes to AR-style rifles: scope height and eye relief. Leupold Tactical Optics undergo arduous environmental and impact testing to ensure they meet the highest quality standards for durability and dependability. Leupold Tactical Optics are backed by the company’s long history of customer-satisfaction warranties. 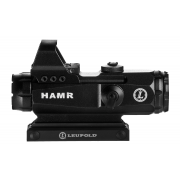 For warranty information on specific products, call 1-800-LEUPOLD (Option 4) or email tacticaloptics@leupold.com. For additional product information, go to www.leupold.com. American war fighters, law enforcement personnel and competitive shooters to design and build products that meet their needs. Currently, more long-range Leupold Tactical Optics are in service with the U.S. military than any other brand. rifle, handgun and spotting scopes; binoculars; range finders; trail cameras; flashlights; mounting systems; and optical tools and accessories.